Register Log In GliderCENTRAL Forums Breeding & Babies Creaminos having creamino with platinum mosaic spots and or mixed coloring? I am completely baffled because in my limited knowledge I was under the impression that creaminos always have creamino joeys.One father and two sisters are the parents who all came from creamino parents and show no signs of anything besides creamino. They had 3 litters back to back each. The more mature sister had 3 sets of twins and the younger had 2 twins and a single. The first set are dominant platinum from both mothers with creamino coloring added in. Some have the garnet eyes and one doesn't. One has an almost entirely black tail but without any question they have creamino coloring added in. The next two sets came out almost like 4 twins as they are very light and even the plat is extremely light. Their hair is mostly creimino but if you examine closely you can see where the plat hairs are mixed in throughout the body and dominant only where the mosaic areas are. What I want to know is WHAT THE XXXX ARE THEY? I had never heard of mixing these colors and was under the impression that it was not even possible. The only reason I haven't posted pics is because it is a nightmare to get it to show up on them due to lighting etc but in person they are instantly identified. Please someone give me advice. Thank you so much. I am moving this to breeding and babies for better exposure. I am not sure how the Creamino lines work. Creme~ino is a recessive gene. Both parents need to possess the gene in order to reproduce it. If only one parent is a Creme or het and the other has no Creme in the background, they will not express the color. When we breed, we should have a minimum of 5 generations on each side of our gliders to make sure we are not breeding too closely. There are only a few lines of Creme~inos, so we need to be extra careful about that. If you could show here the lineage on both parents, we could better tell how they are getting these colors. Also on the "Platinum Mosaics", are they True Platinums or what was once incorrectly termed as "Platinum Mosaic". In the past, some of the breeders used the term "Platinum Mosaic" when the animal wasn't Platinum colored. It was very confusing, which is why we now use the words "True Platinum Mosaic" to describe an animal that is both Platinum colored and Mosaic at the same time. Platinum is also a recessive gene and both parents need to carry the gene in order to reproduce that. Unfortunately, we cannot post photos here any longer, so I cannot show you a proper example of a True Platinum Mosaic. Last edited by Marsupial_Mayhem; 08/22/16 11:45 AM. I don't know if this will work, but this is the link to an album of a boy that I have who is a True Platinum Mosaic. The Platinum coloration is reddish brown in color. He is also a Mosaic so he is demonstrating both a recessive color gene (Platinum) as well as a dominant gene (Mosaic). Dominant genes are one in which one parent must be a Mosaic (White Face Blonde is also Dominant), in order for any of the joeys to be the dominant color as well. Without having a link to the lineage, this is very difficult to assist. I'll try to explain what we know based on historical breeding. In order to produce a creamino joey, because it is a recessive gene, both parents must have at least one copy of the creamino gene. You can have both parents being a het (means they are not creamino in color, but have 1 copy of the gene) or they can be a creamino, or one of each. Platinum is also recessive, but works a little differently. Each parent can either have/carry the platinum gene, or one parent can have/carry the platinum gene and the other parent can have/carry the leucistic gene. To complicate things a bit, you can have a double recessive. These gliders are commonly referred to as "Red Eyed Whites" or "Ruby Leu". This is where the glider is both a Creamino AND a Platinum (or other variety of a double recessive). However, these gliders do not look like what you are describing. These are more white in color. Creamino x Platinum - tends to come OOP solid white and by the time their eyes open a faint narrow diamond on the head and a faint stripe that does not pass the neck will appear. The diamond and stripe are a light cream color. As the glider matures, it may turn solid white and loose the diamond and stripe. I have never heard of a glider that expresses both colors of plat AND creamino. I wonder if what you are seeing could be the results of some pouch staining on the fur? Time will tell this as it will go away after a while. I understand good photos are hard to get. You may need to use a macro setting on the camera and have the right lighting to get it to show in a picture. Do you have a link to their lineage in TPG database? That will help in determining what you have. It's quite possible that you have a mosaic that has varying shades of fur. I'd love to see a good photo! Here is the link to my website. 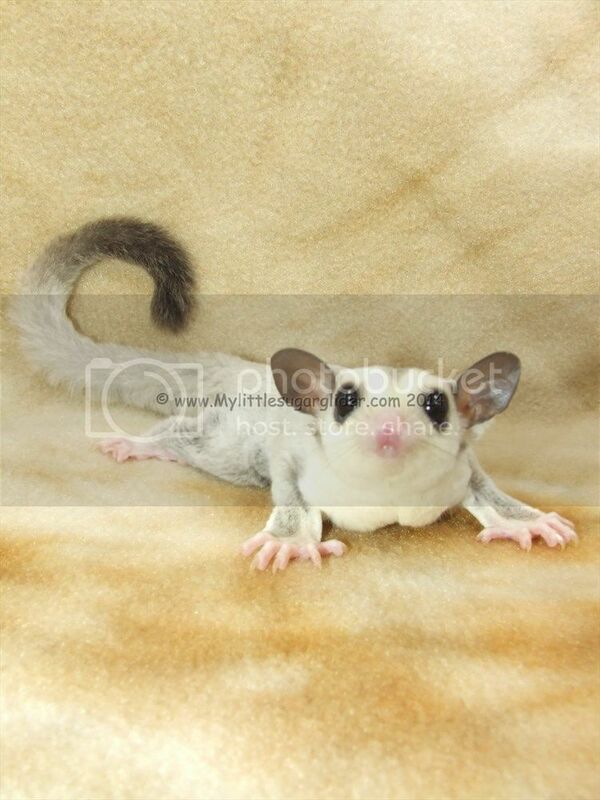 It has a lot of information regarding breeding, understanding genes, and colors of gliders.